Which weighs more: a ton of feathers or a ton of gold? 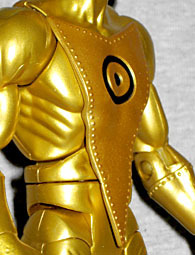 Gold is a member of the Metal Men, amazing automations invented by the brilliant roboticist Professor Will Magnus. Each Metal Man is equipped with Magnus's most famous invention, the Responsometer, which gives each metal a highly individualized personality and allows them to change shape according to the properties of the metal they represent. Gold serves as field leader of the team, supervising their individual efforts when they're in the field, or overseeing their combination into larger constructs. Each of the Metal Men has the properties of the metal he's made from, right? So Gold, here, would be incredibly heavy, but also incredibly soft? A single ounce of gold can be beaten into a sheet covering 300 square feet, and gold leaf can be made thin enough to become translucent. Yes, light will shine through solid metal. Science is awesome. Gold uses a skinny body - he's not the team bruiser, so that's fine. He doesn't wear a smock like Iron, but there is an arrow-shaped bib glued to his chest. It's a part of the character's design, but it really doesn't work so well on a figure like this - it dangles improperly over his joints. He may have been better served by sculpting the shape onto him, rather than making it a separate piece, even though that would have been tough to pull off. While Gold gets fancy forearms and shins, they're not the same ones Iron had: although the rivets around the tops of the boots and gloves are similar to Iron's, Gold's "skin" is smooth and flawless, unlike the pitted texture on Iron. Since we always pick on Mattel when they reuse parts poorly, it's only fair that we take the time to praise them when they use new parts smartly. The symbol on Gold's chest and forehead is the Egyptian planetary symbol for the sun - while most metals are grey or whitish, gold is yellow like the sun. Its Latin name, "aurum," is ultimately derived from the Greek "aurora," or dawn. He has a surprisingly heavy brow, and a frown on his face. My exposure to the Metal Men is limited, but that seems wrong - he should be vain and overconfident, not morose. You know, a big smarmy grin; a face with personality! 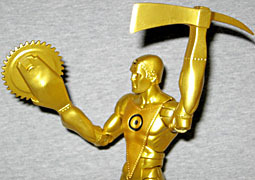 Gold comes with two accessories to simulate his shape-changing abilities: the gimmick of the Metal Men was that they were always changing themselves into zany shapes, like Plastic Man. Obviously a toy can't do that, so we make do with accessories. For his left arm, a large pick-axe; for his right arm, a spinning buzzsaw. The pieces don't fit on perfectly - in fact, there are large gaps where they should seamlessly merge with the forarms. In order to have them line up without looking odd, he has to have his palms facing up, which breaks the illusion anyway. There's no metal used for the add-ons; the initial promise was real metal pieces for the Metal Men, but on Gold, only his hands are cast from the stuff (you can tell because they get cold at room temperature). 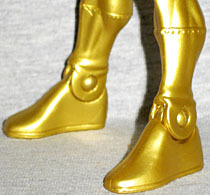 Gold comes with Ultra-Humanite's left leg, which is the same height as his own leg. It's white and furry, and has soft gray shadows. There are joints at the hip, though, knee and ankle, so the assembled monkey-villain will surely have good poseability. He also includes a collector button, featuring a generic piece of character art rather than a part of a comic cover. Gold really highlights the idiocy of these things: anybody who wants the Metal Men is going to want all six of them, but only two will have the pins, meaning that particular collection will be permanently incomplete. Smooth move. Gold isn't a bad figure. They could have done his costume better, and the face is very boring, but his accessories are decent, and the golden paint apps are very realistic. This isn't the greatest DC figure Mattel's ever made, but it's a very solid effort. Oh, and incidentally, the answer is that a ton of feathers weighs more than a ton of gold: while feathers are measured the normal way - 16 ounces to the pound - gold is measured in Troy weight, which has 12 ounces to the pound. If you convert a normal pound to troy ounces, it weighs 14.583 troy ounces, and is thus two and a half ounces heavier than a troy pound.